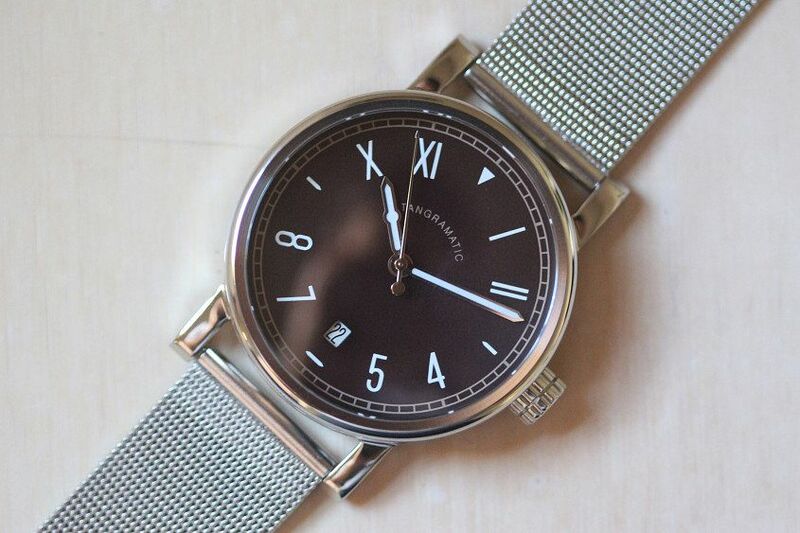 In a bunch of fresh-faced Australian brands Tangramatic is perhaps the freshest face of all – founded just last year by Sydneysider Francis del Mundo after he discovered the world of horology via the rabbit-hole that is Watchuseek. It’s a testament to the amazing opportunities of crowdsourced funding and golobalised production that del Mundo was able to express his love of watches by designing his own. The watches of Tangramatic lean towards the dressy end of the spectrum, with a distinctive design aesthetic that’s somewhere between Bauhaus minimalism and early ‘60s funk. The standout model for me is the 39 Alpha Brown California. Clearly Tangramatic are believers in the ‘what you see is what you get’ school of model names, as the most distinguishing feature of the watch is its (you guessed it) brown California style dial, in a 39mm case. Now what, I hear you ask, is a California dial? Good question. Essentially a California dial is one where half the numerals are roman, and half arabic. The reason why it’s called a California dial is one shrouded in horological lore and conjecture. Some say that the dial, found on early Rolex references, is called the California dial because they were very popular in that state, the result being that vintage dealers scoured the country for examples leading them to be nicknamed ‘California’ dials. Another version of events tells that a dial refinisher named Kirk Rich from LA refinished Rolex dials in this style, and the style became associated with California. Whichever legend you choose to believe, there’s no doubt that Cali dials look cool, and it’s rightly the highlight of this watch. The brown dial on the Tangramatic is a good choice, as it adds a bit of vintage warmth to what is otherwise a fairly straight up and down steel watch. The curving logo text (another nice vintage element) is unobtrusive and well proportioned. And the handset has a few nice details like the tiny arrow tip on the seconds hand and the lollipop midway down the hour hand, which neatly follows the curve of the logo text. These small details are needed to keep the design interesting, especially on such a restrained piece. While the dial of the 39 Alpha is a neat and clean example of the type for me the case is lacking somewhat in elegance, as the three part case has a very top-heavy feel, due largely to the lugs being set very far back on the case. Design-wise the case is clearly informed by the minimalist school of design and watchmaking. Think Junghans. If you’re into this sort of simple dressy style the chances are good you’ll be happy with the rounded curves and straight lugs of the Tangramatic. The Milenese mesh that came on this model is, in concept at least, a perfect choice. But this example is a little thin and stiff – if this was my watch I’d swap the strap out for a nice simple calf strap or even a colourful NATO. 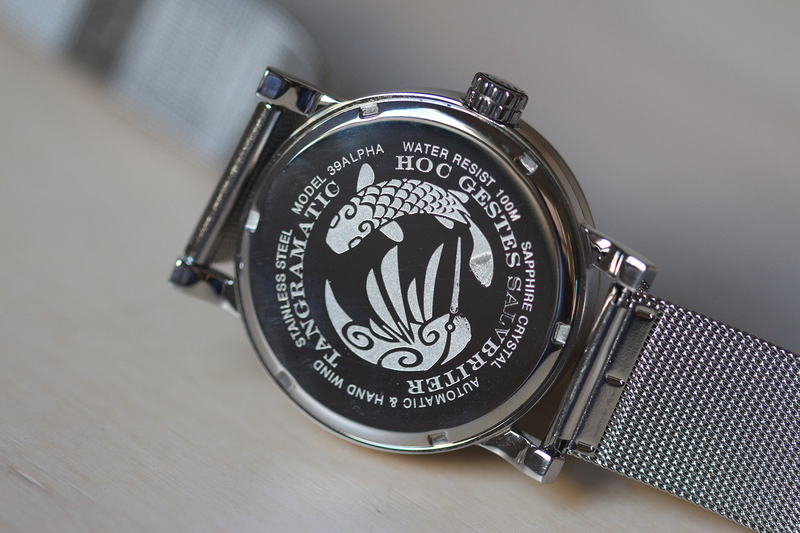 The movement is the Miyota Cal 9015 – a proven performer at this price point. 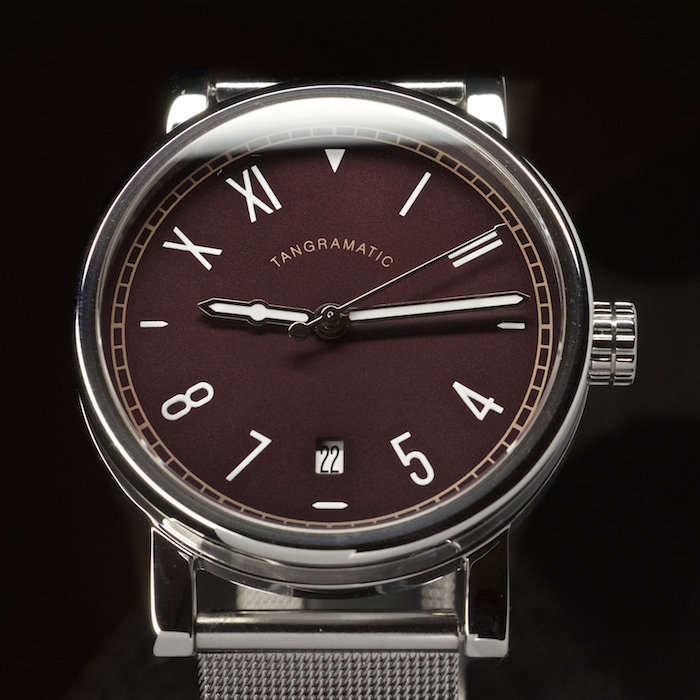 And speaking of price, the Tangramatic 39 Alpha Brown California has a retail of $420 on mesh. All in all I think that there is clearly passion and a strong aesthetic sensibility behind Tangramatic, and the brand should be commended for making original designs, but they’re competing in a tough market. 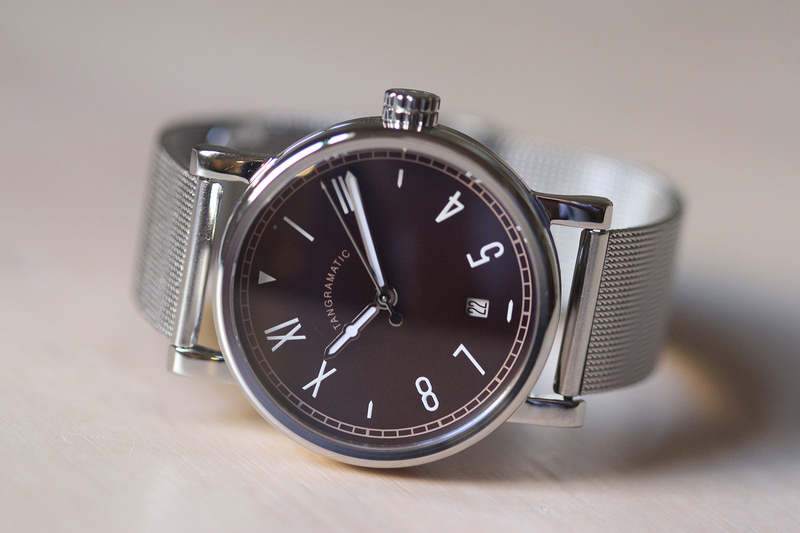 I hope that Tangramatic thrives in the cut-and-thrust world of microbrands and the vagaries of international production because I think that the watches we’ll see from the brand in 12 months will be impressive.